I have actually argued for both strategies at different times, and I currently think that there is no way of knowing how world events will develop making either strategy better (perhaps no-one in the world knows). It is healthy that different socialist organisations (often Marxist ones but the strategies are reflected by approaches in broader parties like the Scottish Socialist Party (SSP) which sees achieving socialism in an independent Scotland as the priority in the short term) take different approaches, since if socialists “put all of our eggs in one basket” our enemies would change strategies to defeat us. A similar if rather unrelated point is that although I voted at a special conference for my former Marxist organisation, the Militant Tendency, to leave the Labour Party (firstly in Scotland to form Scottish Militant Labour which later united with other socialists in the Scottish Socialist Alliance and transformed that alliance into the SSP), it is good that a minority stayed in the Labour Party (around the journal Socialist Appeal which organises internationally as the International Marxist Tendency). It seems to me very likely that Labour will split after the next election, especially if they come to power and disillusionment with their continuation of austerity (which Ed Miliband and Ed Balls have committed Labour to for at least a year) sets in, and Socialist Appeal could play an important role in the left splinter, with them perhaps becoming part of my current broad socialist party Left Unity. The two theories I mentioned at the start of this blog post are reflected in issues such as Scottish (and Catalan) independence – with pretty much all Marxists supporting their right to self determination, but with some, including the Communist Party of Great Britain (PCC) which produces the Weekly Worker newspaper (to which I have quite often submitted letters to their very open letters pages, despite significant political disagreements), calling the approach of the SSP and others advocating Scottish independence, including the Radical Independence Campaign, “left nationalist”. They make similar claims about No2EU – Yes to Workers’ Rights (which calls for withdrawal from the European Union and was heavily supported by late RMT leader Bob Crow). Part of the problem with socialists is that they often make arguments in the abstract, without saying why they advocate a particular approach to achieving socialism, but instead argue on vague grounds such as claiming support for “internationalism” and “unity of the working class”. I will submit another letter to the Weekly Worker based on this blog entry, to make more concrete arguments and help strategic planning. There was a cynical opportunist argument made by some leaders of Scottish Militant Labour, at a conference of that organisation I travelled from Manchester to attend, when arguing in favour of advocating Scottish independence, that they needed to do so “in order to gain the ear of the youth” (with many young people supporting independence at that time). I’m not saying that that particular argument was the primary reason why it was advocated, with no regard to strategies/tactics for achieving socialism, but that others were reluctant to make concrete strategic arguments. From the floor of the conference, I spoke about Scottish people generally being more radical than the UK population as a whole (partly due to the poll tax with the role of Militant significant) with possibilities of a capitalist independent Scotland leading to the “socialist independent Scotland” the SSP argues for, and with the first Western country to go socialist quickly leading to the spread of the revolution across the rest of Britain, Europe and the world. I was criticised at that conference for proposing a “stages theory” (such as that of the original Communist Party of Great Britain before its fracturing brought on by crises within the USSR and Eastern Europe), but that doesn’t mean it was wrong! Shortly before the time of writing, there were signs that the eurozone crisis (temporarily eased by quantitative easing and massive bailouts, at the cost of huge austerity measures particularly in Greece), had restarted – there was another general strike in Greece in the run-up to Angela Merkel’s visit and mass demonstrations in Italy and France. I have previously called for “a worldwide general strike” when G8 or G20 summits have taken place – most seriously around the G8 summit in Gleneagles (Scotland) in July 2005 when there was a very big Make Poverty History campaign in Britain and “Live 8” concerts in different cities around the world. This was aimed at solving problems of extreme poverty in “underdeveloped countries” (by getting government aid rather than raising money through charity as with Band Aid 20 years earlier) rather than achieving socialism, but there were tremendous opportunities to make a significant difference in that direction (with the SSP using the slogan “Make Capitalism History”). However, the 7/7 tube and bus bombings in London happened midway through that summit, taking media attention conveniently away from the summit – more evidence that terrorism plays into the hands of big business and capitalist politicians who largely reflect big corporations’ agenda (which we could now call the 1%). Last year (2013), I called for a similar global strike, mainly using the Facebook page Launch an international general strike on 1 May against the 1% and a music video with a song I adapted from “The Stars Look Down” in “Billy Elliot, the musical”, and sang as a duet with a very good female singer. The video includes a call by Anonymous (linked to the Occupy movement and spottable in Guy Fawkes V-for-Vendetta masks at many demonstrations) which argued for such a global strike via a video (parts of which I incorporated within mine) – and is doing so again this year. This year (2014), I discovered at the national People’s Assembly Against Austerity recall conference that the London May Day Organising Committee (LMDOC) were calling for support for a demonstration that they organise in London on 1 May (which they argue should be a bank holiday like in most countries in Europe so more can attend) every year and urge “unions involved in industrial action to consider May 1st as an appropriate date for such action.” Their supplementary motion was carried so the People’s Assembly officially supports it and is advertising it on an events page on their website. In 2014, I have prioritised publicising the London demo, mainly due to its possibility of kickstarting coordinated strike action (that the Trades Union Congress voted for two years in succession, with union leaders blatantly ignoring that position). Although it is fairly short notice again, and it may not be until after the next general election (due on 7 May 2015) when Labour could well be in power implementing austerity (with hopefully some socialist MPs in parliament, but not in a coalition implementing austerity) that mass movements by unions take place, it would be an abdication of responsibility to not even try! 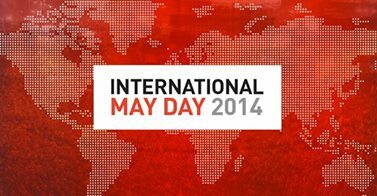 A general strike did take place in Greece last year, as well as some protests in Iran, on 1 May 2013, though I would not claim to have significantly influenced them! Even if the alternative scenario (of a socialist revolution starting in one country before spreading internationally) will ultimately be the way that socialists come to power, it is still worthwhile to organise on an international basis in the meantime. I have modified the video for “The Stars Look Down” to publicise the London demo (and include credits and a better description). Click here to watch the HD version on YouTube or here to watch the non-HD version on YouTube. I have also produced a video this year for an original song/poem by my band called “Austerity Kills” – opposing the scapegoating of benefit “scroungers” by the Tories and immigrants by the British National Party (BNP) and United Kingdom Independence Party (UKIP) – and pointing out that rich bankers are mainly to blame in engineering the credit crunch (which not only caused the bank bailouts but led to a global recession). Click here to watch it on YouTube. I have used my last blog post at Strike/demonstrate on May Day/International Workers’ Day (1 May): Videos and marches in London and Greater Manchester to publicise those videos as well as providing details of marches on Thursday 1 May in London and on the following bank holiday Monday (when most “May Day” marches take place in Britain) in Salford through Manchester. This entry was posted in Benefits, Democracy, Economy, European Union, Internationalism, Music, Poverty, Racism/Fascism, Revolution, Strikes, Terrorism, US politics and tagged 1%, 99%, Anonymous, austerity, big business, Capitalism, Catalonia, Communist Party of Great Britain, credit crunch, cuts, Ed Balls, Ed Miliband, G20 Summit, G7 summit, G8 summit, general strike, international solidarity, International Workers' Day, internationalism, Labour Party, Left Unity, London, London May Day Organising Committee, Manchester, mass strikes, May Day, MayDay, Militant Tendency, Occupy, People's Assembly, Radical Independence Campaign, ruling class, Scottish independence, Scottish Militant Labour, Scottish Socialist Alliance, Scottish Socialist Party, Socialism, Socialist Appeal, SSP, trade unions, Trades Union Congress, TUC, working class. Bookmark the permalink.